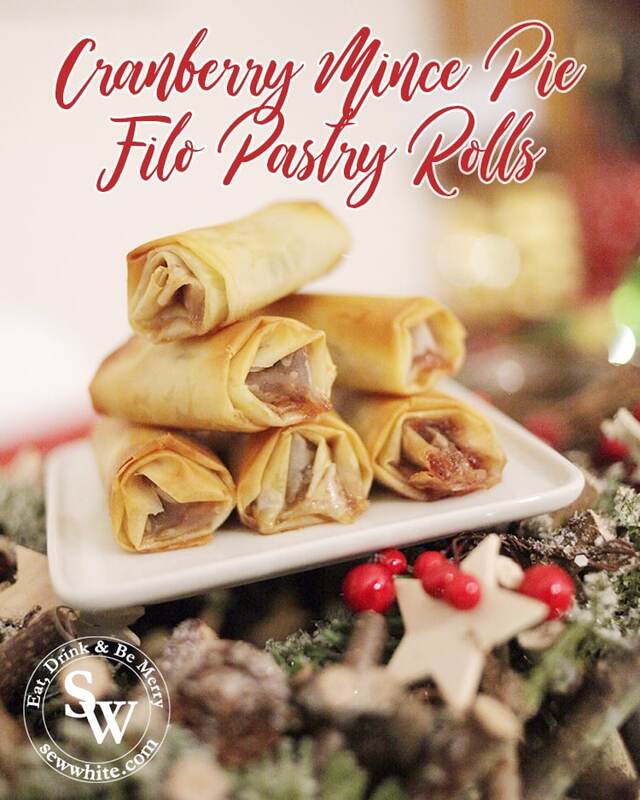 Cranberry Mince Pie Filo Pastry Rolls are so easy to make and far to easy to nibble on. I will definitely be making these each year and will be no doubt making seasonal changes as I love filo pastry and how crispy it is. These would be great to make with children as it’s fun to roll, a little messy and the results are fun to enjoy. They taste fantastic when they’re still hot from the oven, however they taste lovely cold. I really enjoyed dipping them into a little brandy cream. In a bowl mix together the mincemeat with the cranberry sauce, sugar and spices. Preheat your oven to 180ºC / 160ºC fan. Take the first sheet of filo pastry, brush with the melted butter and place the second sheet of filo pasty and place on top. The butter will act like glue and stick them together. Repeat with the rest of the sheets. On the 7th sheet butter half and fold over. Take the first the filo pastry double sheet and cut into 6 slices. (See the how to make the filo pastry mince pies photos below). Using a pastry brush, brush a rectangle around the filo pastry like a frame. Spoon one tablespoon of the mince meat on to the thin side of the rectangle. Fold in the outside edges first and start rolling up the filo pastry mince pie. Repeat with the rest of the filo pastry. (If you have any mincemeat in you can pop it in a sterilised jar and store in the fridge for a days). Put the rolls, join side down on a greaseproof paper lined baking tray. Brush with melted butter and pop them in the oven for approximately 10 minutes and until their gold brown. Check after 5-8 minutes. Allow them to cool a bit before eating as they will be really hot. The also work really well cold and will last a few days. Mix the mincemeat with cranberry sauce and the spices. It will smell incredible! Brush one layer of the filo pastry with melted butter and place another on top. Cut it into six pieces like this. Spoon the mincemeat on the bottom edge of the filo pastry. Fold in the sides to hold it in and then start rolling. It’s fiddly to keep the sides in but after you’ve done a few you’ll be an expert. Keep rolling to the end place on a greaseproof paper line down. Brush them with the last of the melted butter and bake them for approximately 10 minutes.